With Castro’s death, the mass media is full once again of the characters and events of more than half a century ago. As usual their approach to reality is often distorted and ideologically split into two opposing versions. The first is centred on the figure of the "Lider Maximo", the "heroic and sincere revolutionary, standard bearer of the liberation of the Third World"; the second is based on the character of a "ruthless dictator who trampled over human rights". But given the imperialist interests of both versions they hide the facts to the advantage of their own interpretations. They just fire off conflicting opinions on the work of the former Cuban guerrilla to suit themselves, thus shedding little light on reality. Both positive and negative commentators however take for granted the fact that Cuba is ideologically and politically "Communist," both in form and substance, and thus their political and economic characterisation of the system in Cuba, is that it was "created" as a result of a communist revolution. Nothing is further from the truth. Cuba clearly demonstrates that bourgeois capitalist categories dominate the state. Its nature, its structure (with the all basic Marxist economic categories that define capitalism clearly evident), is passed off as the result a "revolution that is being perfected and that is strategically very much alive" day after day .... Showing, indeed, its capitalist content and its bourgeois forms. The deep crisis that is gnawing at capitalism, in every country and on every continent, is forcing the various bourgeois governments to review their political and trading alliances. The weaker countries (such as Cuba) have lost much of the support hitherto enjoyed by those who were interested in giving it: the USSR before its implosion, and then the Venezuela of "oilman" Chavez. The same thing happened with Brazil, while China, which approached Havana ideologically (but mainly commercially) to replace the Russians, is also beginning to have too many problems of its own. A worrying situation for Cuba, now forced to accept as inevitable an opening to the hated US, who in turn "need" to open the doors and windows of new opportunities both in terms of goods and capital. For years the US has talked a lot of "new historic" agreements not only with Cuba but also with other "enemies" from the past, overlooking the fact that the US is still to this day the Number One provider of food to Cuba and one of its main trading partners. The physical disappearance of the "Lider Maximo of the people", which time has reduced to mere symbolic value, could have some positive effect on the momentary thaw in place between Cuba and the United States. However, one unknown remains; the uncomfortable presence of the new American President. And the shifting episodes of political détente are subject to at any time to possible disruptions as a result of a worsening of explosive socio-economic and political tensions in an unstable and uncontrollable international economic and financial situation. Going back in time, it should be remembered that the military "rebellion" organised by Castro against Batista and his "business Cabinet" government was not originally anti-US. His aim was only to put a stop to the rampant, overwhelming and out of control national corruption, which threatened to overwhelm everything and everyone. Castro, leading the guerrillas who descended on Havana was riding almost universal discontent when he ended the bloody Batista dictatorship, was not dismissive of the financial support of those bourgeois (Cubans and Americans) who opted to get rid of their inconvenient and corrupt representative. Castro risked igniting fires which would be difficult to control and therefore had to use some "political prudence". He demonstrated by demanding the immediate handing over of weapons held by students and workers, be they agricultural or industrial. It should also be said that even some sections of the US bourgeoisie were in favour of Castro. Democrat and Republican politicians, however, contended for the title of "eradicators of the communist threat" that might smoulder within or outside of the United States, including in the Caribbean. Castro thus had to be kept under close observation, although he himself declared on several occasions he was not at all Communist (not until December 1961 did he proclaim himself Marxist-Leninist), while tipping a wink towards possible loans from the World Bank and to the Import-Export Bank. Moreover, the relationship between Castro and the PSP (Partido Socialista Popular – the Cuban Communist Party) was not particularly idyllic. In an interview Castro spoke of the “humanist" revolution in Cuba, a "step forward" to restore order in a deepening economic and social disaster. Deep down, he also feared the escalation of a real class struggle, with the working class and not only the peasantry in a dominant position. Having conquered the Presidential Palace, even the agrarian reform law (which could no longer be postponed due to the explosive condition of the rural proletariat) launched by Castro was less radical than the reforms enacted for some time in the advanced capitalist countries and in the US itself. Agricultural cooperatives then arose in Cuba, but it was only when the North American-owned estates were fully confiscated that the US’ nagging worries about the materialisation of a "Communist influence" was confirmed. In particular – one of their main fears – the influence of Russia, the other imperialist pole which aimed to control states and strategic areas was unthinkable, especially close to the American border. Confiscations implemented by the new Cuban government were still compensated with twenty-year Treasury bonds at 4% interest. And regarding sales of sugar to the USSR, these had already taken place even under Batista. However, before a complete nationalisation of American property occurred on the island, the US had already made clear their political attitude towards Cuba. Eisenhower suspended all economic relations with Cuba and Kennedy actually came out in favour of a military intervention against Cuban "subversion". At that point Castro finally carried out the expropriations and nationalisation (of companies, banks, and multinationals, including Coca Cola and Westinghouse). The enthusiasm and popular support for Castro increased. Propaganda claiming the revolution as "socialist”, confirmed by nationalisations against the American imperialists especially after the Bay of Pigs (1961) invasion, managed by the Italian-American Mafia, failed. The applause, and the aid, of the Russians was by then expected and reciprocated by the jubilant Cuban "people", while the US had the confirmation of the presence of a neighbour with little inclination to accept their commands. This is not to deny, as does the dominant, thick-headed thinking of the mostly pro-US bourgeoisie, that some "benefits" were given to the Cuban populace, especially when one looks at the comparison with the previous regime. In the first ten years of the Castro government, the number of hospitals went from 44 to 221; a free medical service spread along with public education; illiteracy was eliminated. Some improvements in the social field undoubtedly exceeded those obtained by ... the Pinochet regimes in Chile and the military junta in Argentina. The Cuban people (in the normal cross-class meaning) saw an improvement in their living conditions compared with previous governments and was convinced of being "humanly guided" (according to what the leader at the centre thought), and therefore accepted state rules demanding that the proletariat work harder yes, but for the collective well-being and the country's "democratic" independence. Inevitably, to oppose that regime was to be labelled as "subversive", thus risking being shot. Castro manoeuvred carefully, even embracing Kadar, the butcher of the Hungarian Revolution. On the student protests in China he made a statement calling it "a Chinese internal affair. The images have not reached here ... We know, however, the official version of the Chinese government, and we have no reason to doubt their explanations ". “Cosi Fidel” (So Fidel Said), interviewed by G. Mina. At the same time, Castro could not (given the actual content and the specific characteristics of the dominant economic system in Cuba!) do without the presence of foreign capital (with joint ventures, obscuring the capitalist reality ...) above all in areas such as tourism, nickel, fuel, telephone, food industry, steel, machinery and services. Indeed, the finance was accepted for the economic good of the island ... The important thing – he repeated – was to keep the "revolutionary perspective" alive, firmly in the hands of Castro ... Who tried to take advantage of inter-imperialist, disputes and tensions, participating in the movements of "national independence" which flared up and died down especially on the South American continent ... and around the oil wells. We have mentioned the Cuban support to ideologically similar governments and guerrillas in countries listed as underdeveloped. This went on until the collapse of the USSR and the end of its subsidies diminished such scenarios. 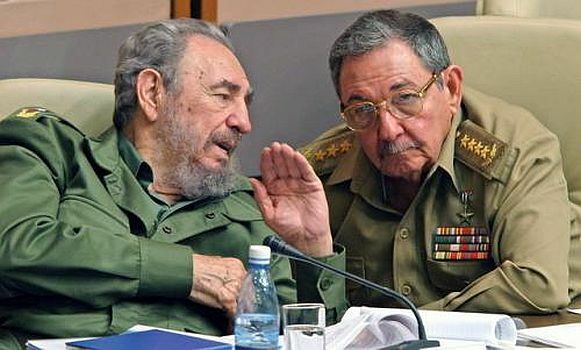 Today the memory of the "barbudo” (bearded one) Castro’s assault on power (almost sixty years ago) is fading in time, as is the disastrous attempt at an anti-Castro invasion, while the economic blockade imposed by the United States is no longer sustainable for both sides. The North American bourgeoisie (including the Mafia) sniffs a recovery across the board for a profitable management of their own interests, for too long disturbed by a state capitalism which, moreover, had looked for help to the Russian imperialist competitor, of "socialism in one country", trying to take advantage one of the many conflicts that accompanied the" cold war ". The cross-class nature of the system is always firmly hidden behind a rhetorical avalanche of propaganda, in which all the causes of so much painful poverty and oppression are due only to imperialism in Washington, not of capitalism in general, which continued to weigh on the island with its laws of motion and the social relations arising from the exploitation of wage labour. These are not "necessary sacrifices for socialism"! Suffice it to mention the most recent attempts to reorganise the State and Government in an attempt to avoid a dangerous economic meltdown, with measures like: tax increases, wages linked to productivity, higher profits from public enterprises, and more opportunity for both industrial and commercial private companies. The exploitation of the proletariat, as in any capitalist “programme” will be intensified as "productivity" has to increase, and direct and indirect wages (including services of all kinds) must not be excessive ...! With the necessary layoffs of "the superfluous", starting with the state industries, approved by the Cuban Union who proclaimed the inability to "keep overstaffed enterprise generating losses that hinder the economy, (...) generate bad habits and spoil the workers”. Not only that, but – as the Cuban leader of the CTC (Cuban Union Federation) said – "the laid off will carry out private activities that yield much more"! Last but not least, is there a chance of an official "return" to the opium of religion? In the latest episodes of the understanding born between Castro and Pope Bergoglio (Francis), the latter expressed "feelings of special consideration and respect" for the old "guerrilla". The process of "rapprochement" between Cuba and the US has the Pope as its prestigious mediator, who, in turn, will have the opportunity to take quite a few advantages from an official reopening for Western capital. With a Mass in the Plaza de la Revolución in Havana, in front of a giant poster of Che, another miracle meanwhile took place, (with the papal visit to the sick Fidel), in the name of divine mercy and the Cuban brand of "National Socialism". Finally, an embrace from the universal Church with which Castro – after meetings with Popes Wojtyla (John Paul II) and Ratzinger (Benedict) – had been able, through some of his personal experiences (so he had confided), to "appreciate many aspects of the thought", of the Papacy ... The same shock seems to have affected his brother Raul, who like Fidel was a pupil of the Jesuits, and who recently said: "If the Pope continues like this, I will return to the Catholic Church." Altogether now: Amen! In reality the US since 2002 has been one of the main suppliers of food products to Cuba which is forced to import 70% of its requirements. Havana has also sought to attract industrial investment and the US also (with China, Brazil, Mexico, etc.) took advantage. First of all the agro-food lobbies, tourism, automobile, machinery, infrastructure, telecommunications and pharmaceuticals. All have taken advantage of every little "crack" to fit into spaces that opened in the structure of the Cuban capitalism. The official embargo has certainly complicated and made the commercial and financial “paths” go underground, but with Obama - and time - facilities on travel, possibility to send remittances, import of Cuban products and authorisation for financial cooperation between US and Cuban institutions have come about. Sources: *SPI (Istituto per gli studi di politica internazionale) 20 luglio 2015. The US-Italian Mafia had lost most in the fall of Batista since they had found his (and the three) previous regime (s) complicit in their gambling, prostitution, money laundering, drug and real estate rackets. They turned Cuba into a playground for the rich.